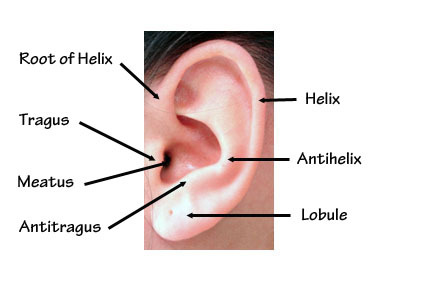 Also called ‘Helical rim’, it is the curved piece of cartilage that makes up most of the rim of the ear. The curved prominence of cartilage in front of the helix. Often this is poorly formed in a prominent ear. Also sometimes called the ‘Conchal Bowl’, it is the deep bowl in the centre of the ear. This is the point where the Helix joins the cheek below the sideburn. This is the small prominence of cartilage in front of the ear. Sometimes called the earhole or External Auditory Meatus, it is the hole which transmits sound into the ear canal to the eardrum. This is the prominence of cartilage opposite the Tragus on the rim of the lower conchal bowl. Also known as Lobe or Earlobe, it is the fleshy part of the ear that many people pierce.